Commissioned May 1945 as VT-74 at NAS Norfolk with LCDR H.U. Bush as first C.O. Equipped with SB-2C Helldivers. Did not fight in WWII. Transition to the AD Sky Raider (Later redesignated to A-1). In 1948 was redesignated to VA-25 with the call sign of "PRESSBOX". The squadron patch was a mountain lion, posed in the same manner as the present day patch tiger. (Just no Stripes.) In 1957 the call sign was changed to "CUP CAKE". Much gnashing of teeth over that. In 1959 redesignated to VA-65 so as to line up with CAG Six. Flew the AD-1 through the AD-6 until transitioning to the A-6 Intruder in 1965. 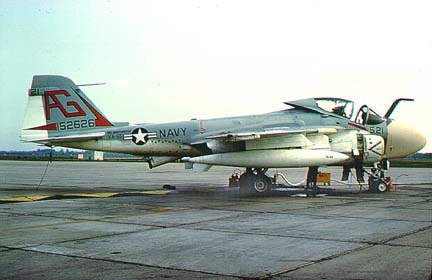 VA-65 made two Viet Nam war cruises. Their success on the 1966 cruise is credited with saving A-6 production. Number of crews lost in combat was lower also than previous cruises. In 1983 the squadron call sign was changed to "Fighting Tiger." In 1991 VA-65, aboard USS Theodore Roosevelt, was heavily involved in the First Iraqi War, "DESERT STORM". VA-65 was disestablished 31 March 1993. There have been a total of 24 Commanding Officers of The Fighting Tigers during the A-6 years. The first, CDR W. Small served from Nov 1964 to June 1966. The last was CDR James Stark. He served from September 1992 until March 1993.